Written by Tristin Campbell. Media by Courtney Murphy. College can be stressful, especially at this point in the semester. So rather than spending hours doing homework, or even just the day-to-day tasks of surviving, you could check out these five unconventional video games. We are starting off this list right because you can technically call this game “studying.” The wonders of digestion are explored in this free game where you play as a hungry moose walking through the forest. As you walk along it is your duty to avoid starvation by tapping to eat the falling food and fill your belly. But beware, some of the falling foods are hazardous and act as laxatives. That’s right, you could potentially lose all of your food to a tragic case of diarrhea. “Super Digestion Moose” is an enthralling game about poo-ing–what a great dose of wholesome fun! As if regular tug-of-war was not exciting enough, we have been presented with this simple yet fast-paced and exciting game. Your prime objective is, you guessed it, to tug on a table. 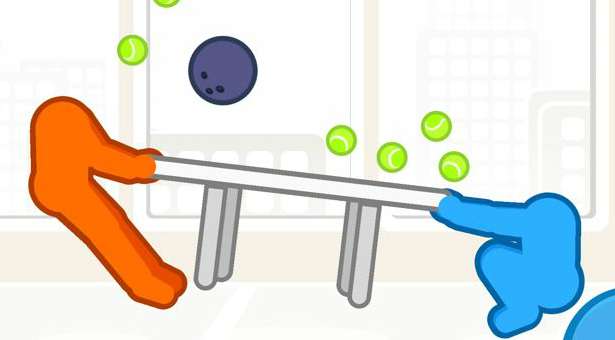 In this game, the typical rope used in tug-of-war is replaced with a table; you can decide between single or two-player mode and battle it out for the ultimate victory of forcing your opponent to step over a line. If you aren’t completely sold yet, just wait until you download the game. Every round something in the game changes. One round things could be normal, the next, you and your opponent could both have gigantic heads with tiny bodies, or maybe even suffer the loss of gravity. Have you ever dreamt of being bread? Or, even better, have you ever dreamt of being toast? Well, you are in luck, because all of your dreams are about to come true. If you are an individual who loves challenges, coupled with rage-inducing controls, then “I am Bread” is the game for you. In this game, you play as a slice of bread whose sole desire is to become toast. Each corner of the bread is moved with a different control, and once you find a way to wiggle out of the loaf of bread that you call home, you then have to work your way through the obstacles of the room. Avoid crawling on unsanitary surfaces or falling on the floor, and if there is no toaster to be found, you have to use your smarts to find another way to get toasted! What a fun and noble mission. The Slenderman-style horror game leads you through Shrek’s swamp, where Shrek seems to have lost it. Your goal is to collect eight onions hidden around the map, without being caught by Shrek, who chases you through the swamp, and gets faster and more threatening with each onion you find. I guess I lied to you in the title of this article, because upon downloading “There is no Game” you will CERTAINLY not find a game. As the narrator of the game (I mean… the non-game) will tell you, there is no game here, and you could be doing much better things with your time anyway. Whether or not you listen to the narrator is up to you; you could stick around and pester him with the underlying hope that you stumble upon a game, or you could just go about your day. Actually, I think that’s your best option–ignore the curiosity building inside you, forget that I ever dangled this option in front of you, and just go about your day. So, put down those textbooks and pick up your laptop. Blow off some steam before the end of the year with these ridiculous, but wildly entertaining games. Happy Gaming!